1. Preheat the oven to 200ºC gas mark 6. Place the tomatoes in a small roasting tin in a single layer and tuck the whole unpeeled garlic cloves and bay leaves between them. Scatter over the chilli and seasoning and drizzle over the olive oil. Roast for 20 minutes until the tomatoes are soft and juices running. Add the chick peas to the tin and cook for a further 5 minutes. Remove and peel the garlic cloves and mash the cooked flesh. Add back to the tin and mix together. Remove the bay leaves. 2. Meanwhile cook the pasta in plenty of boiling water for 10 minutes until al dente, then drain. Add the contents of the roasting tin and toss together with the fresh basil, season. 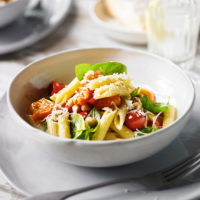 Serve in warm bowls with grated Parmigiano Reggiano and extra virgin olive oil for drizzling.